Interesting line between arrogant genius and sympathy for mental illness. 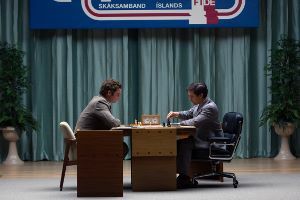 The main part of the plot is the 1972 World Chess Championship. American Bobby Fischer (Tobey Maguire) carrying the hopes of his country versus Russian Boris Spassky (Liev Schreiber) defending the Soviet Empire. While it is set during the Cold War, there isn’t a huge emphasis on the political maneuvering of the times. The mental state of Fischer guided the movie instead. It starts in Brooklyn with Fischer as a young child. Already paranoid and socially-maladjusted, it’s clear that being a chess prodigy probably wouldn’t help. But his mother takes him to a chess grandmaster where surprisingly, Fischer loses. But he is a child, and his opponent was a chess grandmaster. But it was his reaction to the loss that set up the rest of his life, and the rest of the movie. Fischer was determined to prove that he was the best chess player in the world. He would often speak out against the Soviet Empire and in the process creating more mental unrest for himself. Two supporting players come into the mix at this time, both important to Bobby Fischer but he was perhaps too far gone to realize what they actually offered. Images courtesy of Elevation Pictures. Paul Marshall (Michael Stuhlbarg) is a lawyer who approaches Bobby Fischer and persuades him back into professional match. He put up with Fischer’s paranoia and nonsense demands with relative ease and always seemed to be able to get Fischer to just play chess, which always seemed to calm him. It’s suggested that on behalf of the U.S. government, Paul Marshall was using Fischer was a pawn in their Cold War games. Marshall also brought in Father Bill Lombardy (Peter Sarsgaard) who’s a priest, former childhood friend of Bobby Fischer and fellow chess genius. Fischer could use him as a coach, but the two rarely got along and Lombardy never wanted to humour Fischer and his increasingly bizarre antics. Sarsgaard for once got to play an honest, whole-hearted caring individual and it was great. With the help of Tobey Maguire’s performance, the film walks the interesting line between arrogant genius and sympathy for mental illness.